1981 was a heck of a year for music. One of the shocks that it held for me was the shocking re-emergence of a band I’d only ever gotten into a few years earlier during my “Prog Phase.” In 1978 I was on a Prog tangent but didn’t manage to get too deep before I was distracted by the emerging Post-Punk phenomena. Nevertheless, while listening to FM Rock that year, I’d heard King Crimson [guess which track] and made a bee-line for that first album. While the mellotron antics of the title cut pointed to a group like The Moody Blues, the toughness [to put it mildly] of jazz damaged tracks like “21st Century Schizoid Man” didn’t reflect any previous parts of my musical diet. A few years later I bought a copy of “Starless + Bible Black” and found it to be my favorite KC album of the several I’d heard. By 1979, I was all over Robert Fripp’s first solo album, the still amazing “Exposure.” Fripp was experiencing a vast lateral shift that saw his approach to Art Rock having a greater congruence with Post-Punk rather than the dying dregs of Prog. He even guested on Blondie records! Even so, the idea that he would ever re-form King Crimson was fairly inconceivable since the man gives off a rather severe aura. How could he ever backslide into a King Crimson reunion? Ever so gently, it seemed. 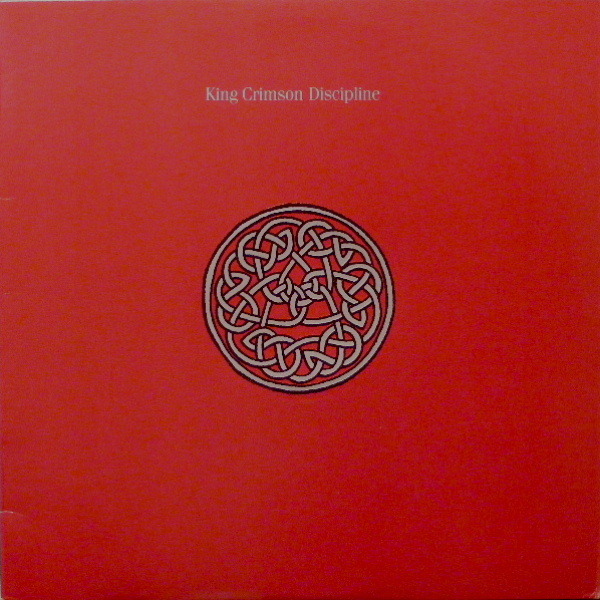 The new Crimson had begun their life as “Discipline” but over time, the band convinced Fripp that this was not just a new group, but new growth from the King Crimson root. Master drummer Bill Bruford had played on the last three KC albums. Bassist Tony Levin was known to Fripp by his playing on the first three Peter Gabriel albums. The wildcard was second guitarist and vocalist Adrian Belew, who came to prominence when Frank Zappa plucked him out of a hotel lobby and then it seemed everyone wanted a piece of him. Sessions and tours with Bowie and Talking Heads cemented his credentials and he was the busiest guitarist of this period as previously recounted here. A friend gave me the “Discipline” album as a Christmas present and it’s been an astounding album from the first play to this very morning. To this day I can hear “Frame By Frame” and forget to breathe. But I’m getting ahead of myself. The album kicks off with “Elephant Talk” and from the moment the needle hit the PVC it was apparent that this was a King Crimson that wasn’t looking backward one iota. The opener reflected recent Talking Heads more than anything, due to the presence of Belew; fresh from that band’s acme “Remain In Light.” But vocally, he resembled David Byrne. Enough so that the rest of the Heads had asked Belew to front the band instead of Byrne. Belew correctly discerned that such an offer was very dangerous, so he wisely demurred. “Elephant Talk” offered a newly funky Crimson that one could almost dance to if one wanted. Levin’s Chapman Stick work first graced my ears on the previous year’s jaw dropping Peter Gabriel album, so I was more than ready to hear him cut loose without any restraint. Bruford’s rhythmic fills were as ever, cut like fine diamonds. This was the sound of a band who had taken a look at their competition [primarily Talking Heads and Japan] taken stock and proceeded to blow them out of the water as only they could. If “Elephant Talk” showed a loose and funky side of the group, then “Frame By Frame” burnished the group responsible for “Red” and “Lark’s Tongues In Aspic” to a brilliant sheen. Fripp’s propulsive guitar figure seems more like a tightly sequenced synthesizer with his inexorable leads speeding along with a series of sixteenth notes that Bruford punctuated with tattoos of drum fills that pummelled and roiled the surrounding music like torrents of staccato quicksilver. At abrupt points in the song, the tempo shifted suddenly to touch base on straight 4/4 time before soaring off into wilder tangents again. I can’t emphasize just how powerfully this track affects me. It’s still my favorite King Crimson track to this day. After the tour-de-force of “Frame By Frame,” “Matte Kudasai” comes as a gentle zephyr of a tune. I can’t recall the band sounding this relaxed before as Fripp’s guitar lines keen like gliding seagulls. A track like this shows that it’s not all exotic time signatures and hundreds of notes per minute for this band. The islands of lyrical beauty are necessary to give respite to the turbulence elsewhere. As a friend puts it, the punishment/reward ethos of Kind Crimson! Well after that reward it was time for some punishment. “Indiscipline” sounds of a piece with “Red’s” most intense moments. The track began as a subtle buildup of percussion before turning on a dime into a wildly hurtling beast careening through the city at full speed; ignoring the screams of the pedestrians. The lyrics that Belew recites were taken from a letter his then wife had sent him during the recording period regarding a painting that she had just made. When he stops reciting the lyrics, the track ramps up to breakneck pacing in less than a heartbeat. Managing to be both playful and intimidatingly intense at the same time. Speaking of intimidation, Side two of the album began with the pummeling grove of “Thela Hun Ginjeet,” wherein a shaken Belew recounted a street run-in with the threatening denizens of the city outside of the confines of Notting Hill Gate studios in London. Fripp got him to recount the tale to the engineers while making a recording on the sly of the still shaken singer. Appropriately enough, the title is an anagram for “Heat In The Jungle.” Shards of Belew’s guitar vie with Bruford’s serrated knife drums while Fripp steamrolls the song forward with his propulsive, trancelike lead lines. After the peak of intensity on “Ginjeet,” the album dialed down the intensity with the long, languid instrumental of “The Sheltering Sky.” I swear that this track was the impetus for Sting to write the flaccid “Tea In The Sahara” on the last Police album, two years later. The guitar synths that Summers used on the latter can’t help but point back to this far superior tune. Though this lineup of King Crimson persisted through to 1984, they didn’t come close to matching the level of accomplishment on this album, though “Satori In Tangier” on “Beat” manages the trick capably enough. The group then scattered for a decade before reincorporating in a massive “double trio” lineup in 1994 which added Trey Gunn and Pat Mastelatto to the roster that recorded “Discipline” thirteen years earlier. That tour was the first time that I managed to see King Crimson and I was pleased to hear that they performed most of this album still in their set. Hearing “Frame By Frame” live is nothing I’ll soon forget. And my wife won’t forget going to a concert where [for once] there was a huge line outside of the men’s restroom but no waiting at all at the ladies rooms! This entry was posted in Blast From The Past, Your Prog Roots Are Showing and tagged 1981, Adrian Belew, King Crimson. Bookmark the permalink. I really like this incarnation of The Crim. My friend and neighbour here in Wales,Maartin Allcock(Jethro Tull,Fairport Convention) did a great acoustic cover of “Discipline” some years ago on his album “Chilli Morning”(2012)- a very difficult track to play he says.Robert Fripp himself approves of his version and mentioned it in his diary. Gavin – Nice to hear respect for “The Crim” as you so nicely put it. Yeah, most Prog is skippable and best avoided but that is a band that actually progressed and kept it up for nearly 50 years (non-consecutive, but still! ).